This post is a guest submission by one of our customers at Peerspace. 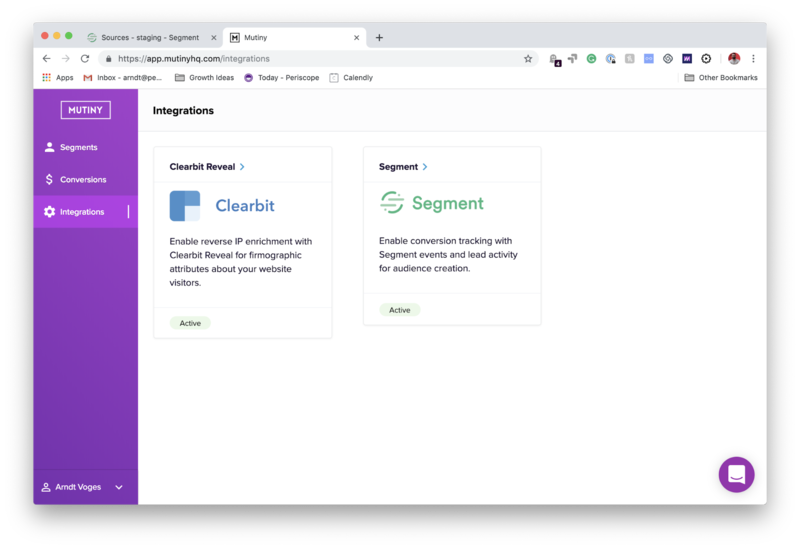 It covers the story of how they were able to use Segment and one of our Connection partner tools to drive awesome results. Thanks to Peerspace for sharing their story! Peerspace is the leading online marketplace for meeting and event venues. Consumers and businesses alike book thousands of event and meeting spaces each month, all through the platform. We have over 10,000 listed spaces being used for activities ranging from corporate offsites, to film and photo production, to personal events, addressing a wide range of individual customer needs across all major US cities. Our web-centric focus has historically been on driving traffic and making product improvements that benefit our entire user base. However, as our traffic has grown, we have increasingly needed to address customer use cases in a personalized yet scalable way to maintain high conversion rates throughout the funnel. Tailoring our message to our diverse set of guests and hosts has required creating a clean data layer to identify visitors, modify website experiences in real time, and instrument a measurement system to assess impact—all within the budget and scrappy means of a startup. We looked at a wide range of tools and ultimately chose Segment and Mutiny to tackle this problem. We use Segment to capture all of our event and conversion data and digest it downstream for important pillars of our Growth strategy, such as analytics, paid acquisition bidding, A/B testing, and personalization. In addition, we chose Mutiny to help us tackle personalization. We have deployed it to dynamically show personalized variations to visitors. 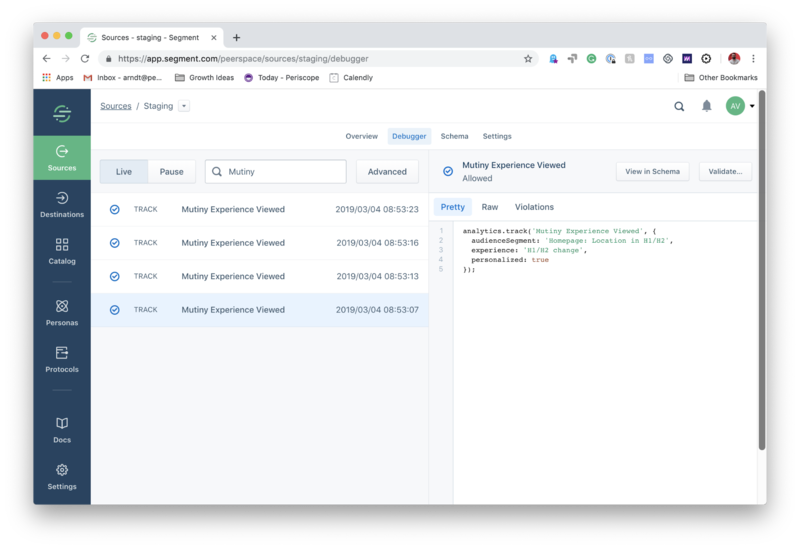 Mutiny makes personalization easy out-of-the-box and has allowed us to test on top of our React-powered, single page application, which has proven challenging to do with traditional A/B testing tools. Mutiny integrates firmographic, contextual, and behavioral data from a variety of sources to identify anonymous website traffic. We use that data to create audiences (such as startups vs. enterprise customers or corporate vs. personal use) and use their self-service editor to modify elements of our website or add additional ones for that audience (such as showing a logo bar to business visitors). Mutiny automatically handles hold-out A/B testing by showing some visitors the personalized content and some the original content in order to measure the change in conversion. Mutiny has a one-click integration with Segment that’s enabled on Mutiny’s interface. As a Segment customer, we can connect our data to Mutiny to create audiences, personalize, and track conversion events. The consistency of the Segment schema has made the data actionable and easy to set up. All Segment data automatically streams into BigQuery as one of our Destinations, allowing our team to marry anonymous IDs through Identify events with downstream conversion data. This enables Peerspace to access complex testing reports through dashboards in Periscope or write their own SQL on top of the raw data. 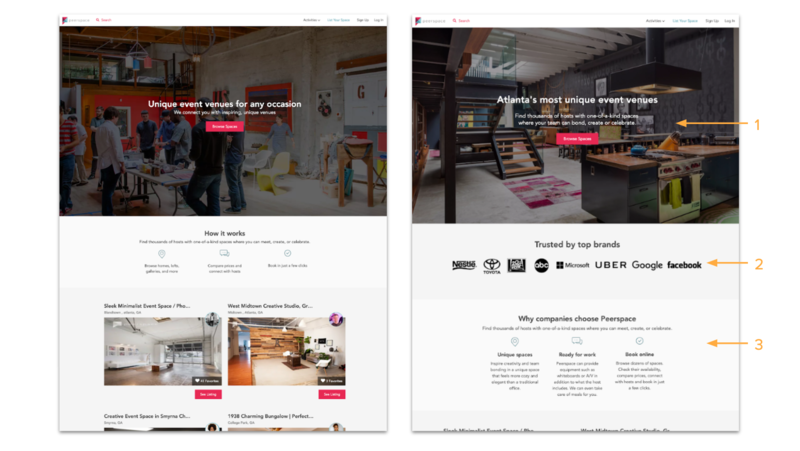 Our team uses Mutiny powered with Segment data to modify and personalize Peerspace’s landing pages and homepage. For example, a business professional visiting the site from Atlanta is instantly assured that Peerspace offers the best venues in their region and that each venue can be equipped with A/V and other business equipment relevant to their specific segment. We have seen personalization increase our user signups by up to 98%. That’s double the users without spending an additional dollar on user acquisition. Since we trust our data, we feel great about the results. We are expanding personalization from paid landing pages to our entire website, starting with the homepage. We are excited to start pulling in a customer’s past transaction data into our landing pages as social proof for visitors from companies we have previously transacted with and to target repeat purchases. This is just the beginning! Arndt Voges is the Head of Growth at Peerspace, the leading online marketplace for meeting and event venues. Prior to Peerspace, he ran Demand Generation at Magento (acquired by Adobe) and led various Growth Product teams at Ancestry.com. Arndt loves to build things and get his hands dirty, from implementing smaller A/B tests to working on cars. He recently took a sabbatical to fulfill his long-time dream to apprentice as a mechanic.